Photo Books are highly profitable but ultra short run book products. The standard today is a custom printed hard cover and high quality digitally printed pages (Duplex). By adding Fastbind photo books to the print products you offer, you can increase you profits and add new market segments to your traditional print operations! The unique Fastbind mountinglift system takes single sided print spreads and mount them into luxury photo albums with a lay-flat opening and a stunning edge-to-edge view on the pages! This panoramic mounted book, generally made for wedding and other high end markets, adds a level of finishing to your operations unmatched in the market. Professional Results, low cost, high value! Albums open up full 180°, no gap in center! Use any paper from Photographic / chemical to inkjet to digital laser, you're in control! Control the quality, control the delivery dates. Your margin is multiplied when binding your album with an entirely customized hard cover made with a Fastbind case maker. 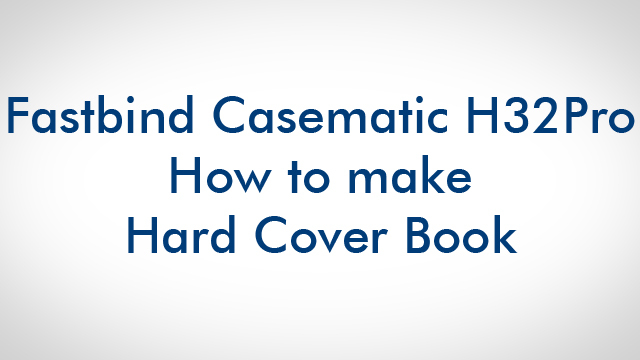 The Fastbind Casematic H32 Pro provides the easiest way to produce your custom printed hard covers, made on demand or in short series. This added value item will help your business grow. With Fastbind Casematic H32 Pro you produce your customized hard covers in minutes, for any format up to extra large 33 x33 cm.